The 2nd Annual Essex County Family Justice Center 5K - “Race for Hope 2019“ - will take place on Sunday, June 2, 2019 in Oak Ridge Park located in Clark, New Jersey. The event will benefit victims of domestic violence in Essex County. Funds raised will help the Family Justice Center provide safety planning and emergency assistance to victims fleeing an abuser, including meals and transportation, formula, diapers, window and door alarms, cell phones, and personal safety devices. Funds will also support the community of HOPE created by the FJC for survivors moving past crisis and rebuilding their lives. Essex County Family Justice Center creates and nurtures a pathway for HOPE to victims of domestic violence through the FJC’s supportive environment and community partnerships. By participating in “Race for Hope 2019”, you will join the collaborative spirit of the Family Justice Center. You will also raise awareness that domestic violence affects millions of individuals across the United States regardless of age, economic status, race, religion or education. Sign up to run or walk, share our story, and inspire your friends, family, coworkers and neighbors to sponsor your “great feat” in support of our mission. 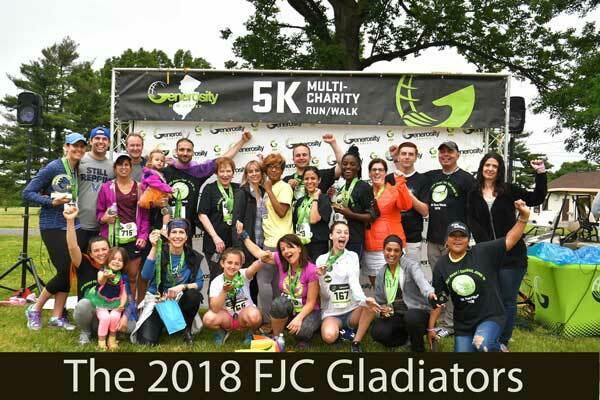 Sponsor a runner – our FJC Gladiators -- and give the gift of HOPE to victims of domestic violence in Essex County. To learn more about Essex County Family Justice Center please visit our website at www.essexcountyfjc.org.